More than 22 years experience in recognition technologies have enabled us to design and create the formidable OmniScoreÂ²â¢ dual-engine recognition system, incredibly making PhotoScore & NotateMe Ultimate over 99.5% accurate on most PDFs and originals! PhotoScore & NotateMe Ultimate picks out virtually every detail and even recognizes 4 and 6 line guitar tablature, 1, 2 and 3 line percussion staves. Our music handwriting app NotateMe is fully integrated, meaning you can write music on the go with your tablet and stylus, or mouse/trackpad if you do not have one. 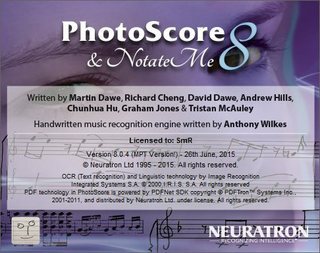 Ease-of-use has been a central design aim right from the start, and with automatic scanning and recognition, plus licensed Sibelius-style editing interfaces, PhotoScore & NotateMe Ultimate even becomes fun and exciting to use! â¢ An IBM compatible Pentium III (or equivalent AMD processor) or higher PC with Windows Vista/7/8/10. At least 512MB is recommended.